In today’s content-drenched digital world, marketers are more hesitant than ever to fill out a lead gen form because they know subpar content often sits on the other side. That means creating standout content is vital to any marketing campaign. If you want to reach consumers, you have to give them content they crave. Consumers don’t want another sales pitch. They want to be entertained. They want to learn. They want to feel supported. Well-known marketer Ann Handley says the best content is useful, empathetic, and inspired. But how do you create content that fits this description? Ask questions! Anyone at your company who has a pulse on customer affairs can help you get inside your visitors’ heads. 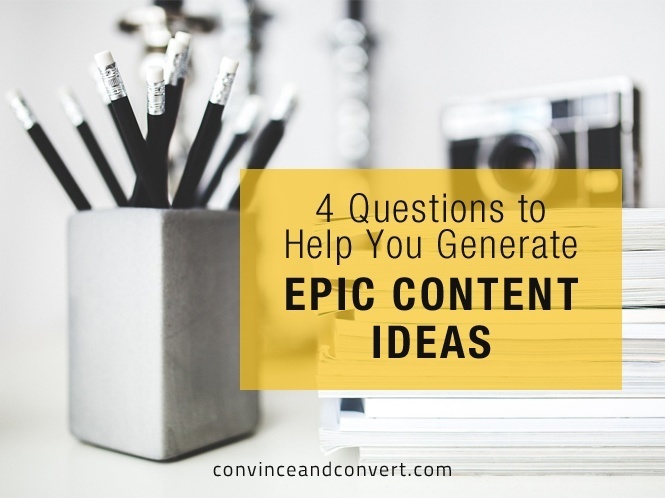 Here are four questions you can ask to gather great new content ideas that will thrill your target market. What Are Your Customers’ Ultimate Goals? Knowing your customers’ long-term goals for the use of your product or service can help you create valuable, relevant content. If people are interested in specific features of your product or service, create content that illustrates how to use those features to their full potential. The more your content addresses specific needs, the more engaged your visitors will be. And they will start to see you as a reliable source of useful information. What Can You Offer Customers That No One Else Can (or Will)? Mapping out what makes your company, product, or service unique can help you further cater your content to customer needs. If you can solve a problem that no one else has solved, use your content to showcase what sets you apart. Consider hosting a webinar or creating a how-to guide to demonstrate your expertise. Attendees or readers will see you and your organization as thought leaders in your space, and they’ll continue following your content. What’s Running Through Your Customers’ Minds at 2 a.m.? Thinking about your prospects’ late-night internal struggles can help you create content that has empathy. Talk to your sales and support teams to gather insightful customer feedback. Then, show your audience you care and understand by addressing their concerns. Start by publishing blog posts that offer thoughtful tips, or draft inspirational case studies that illustrate how others have overcome obstacles to succeed. These types of content will help you connect with potential leads in new and rewarding ways. What Existing Content Might Your Customers Be Willing to Pay For? Don’t be afraid to repurpose successful content. If your community devours a piece of content, chances are they would be willing to pay for content that provides similar information or evokes similar emotions. Did your research report perform well with your audience? Consider creating a corresponding infographic that illustrates the key takeaways, or devise an engaging social media campaign that reveals some of the top data. Compelling content will inspire your visitors to action, which is the ultimate goal. You want to build a relationship with leads so they keep coming back for more. Asking great questions can help you create great content. And if your content is good enough, prospects will have no problem filling out your lead gen form to gain access. That means you’ll increase your chances of capturing qualified leads. If you want more suggestions for revealing questions to ask, check out this interactive e-book on creating a killer content marketing strategy.